Until the unification in 1873, Budapest consisted of three distinct settlements: Pest (German: Pesth), Óbuda (German: Altofen) and Buda (German: Ofen). Buda is situated on the right side of the Danube. In the middle ages, the population of Buda consisted of Germans, Slavs and Magyars. Most of the administrative positions were held by Germans who were part of the city’s elite. 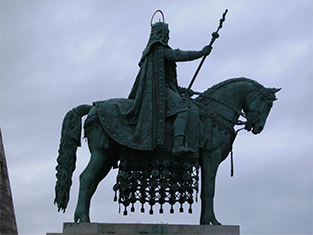 In 1347 and 1355, Ludwig I chose Buda as his residence. In the mid-16th century, Ottoman troops occupied the city. When they raided the town, motivation to reclaim the city rose. Liberation fights began in 1684, supported by Pope Innocent XI who held contacts to other European countries and asked for help. However, all attempts to take the fort were unsuccessful and the Ottoman Rule lasted one and a half centuries. Hungarian Danube city from German regions. In order to speed up the reconstruction efforts Emperor Leopold issued a patent. Hungary became hereditary country for the Danube monarchy. Pest, Buda’s sister city, is located on the left side of the Danube and became the kingdom’s administrative seat in 1723. In this part of today’s Hungarian capital, the first Danube Swabians arrived between 1709 and 1711. Queen Gisela, wife of King Stephan the Saint, brought clerics from German areas to the region. In 1720, Buda already had 12.000 inhabitants, 47 percent of which were Germans, 42 percent Serbs and some Hungarians. Only 60 years later, the number of Germans had risen to 75 percent. On Buda’s side of the Danube, the field names for a long time reflected the German population. However, they fell victim to the politics of magyarisation in the age of reformation. 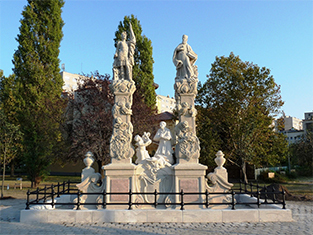 Döbrentei Gábor – a royal counsellor – suggested the re-naming of over 50 geographical names to the city council in June 1847 and all of them were accepted. The intention was to give Hungarian names to Hungarian regions, to strengthen the awareness of history and in some cases such as with the name “Sauwiese” (pigs’ field) simply to prettify the names. Memorial of Saint Stephan in the castle district.